Over the weekend, a massive battle erupted in everyone's favorite extremely complicated space simulator/MMO, EVE Online . 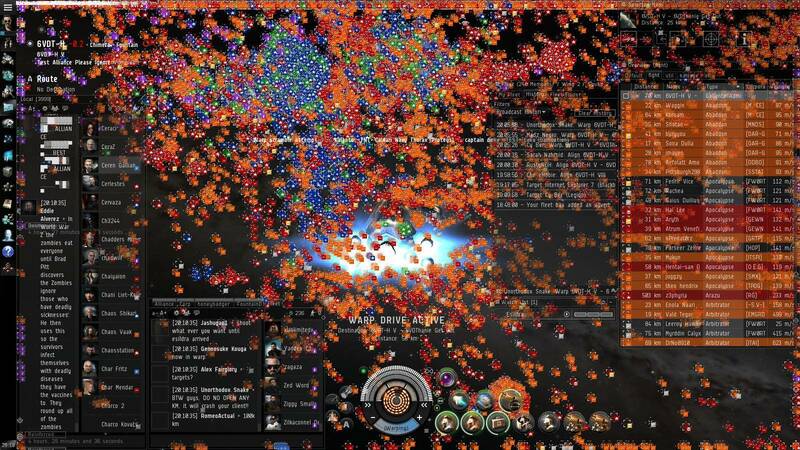 Thousands of players joined what became the largest battle in EVE's history. I'm treading through unfamiliar waters here, having played exactly 10 minutes of EVE about four years ago. However, the nice people at Explain Like I'm Five have a nice summary all lined up for me: somebody accidentally warped all alone to a place he wasn't supposed to go. He called for backup, the backup called for backup and things escalated quicker than Europe after Archduke Ferdinand's assassination. But does it really matter to us why this war happened? No, the thing that matters is how cool it looked. Over 4,000 players piled into a region of space named 6-VDT to slug it out, causing EVE's servers to automatically slow things to 10 percent real-time speed to normalize lag spikes. Enormous warp bubbles piled on top of each other as more fleets came barreling through to join the fight. Estimates say that short of 3,000 ships were destroyed along with millions of tiny virtual lives. The carnage was reported by the BBC and Huffington Post . Maybe it's better if I just write about it. Images from The Verge and redditors Dr_Sandvich and emccrckn in r/eve .